← Heart rehab with Allon Kirschner a man who really cares! Explore local sites with Shelley Brinn! 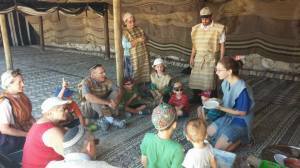 Tour Adumim, based in Ma’ale Adumim, is her enterprise. This interview describes how Shelley Brinn arrived in Israel in her 20’s and through a great life experience created her business. “Aliyah was always in my genes, I always felt more Israeli and Jewish than American. My heroes were from the Bible, not George Washington nor Abraham Lincoln…and, that was just reinforced by the many trips I took to Israel, starting from age 16 when I saved my babysitting money to come to this beautiful country. I later came for a year to Hebrew University where I studied with other American and Israeli students and traveled from the north of the country down to the Sinai, which was then part of Israel. Every time it became more obvious that I was meant to live here. After college in the USA, I spent another great year in Sherut L’Am, which was much like a Jewish Peace Corp. I stayed in this groove with another group program in Tsfat, where I studied half-days, learning about Judaism, and the other half of the day, rebuilding old city structures.. While raising a family of four wonderful children with her husband, who works at the Jerusalem Post as a senior editor, Shelley, who earned a degree in education, worked as a special-ed teacher for over 13 years in different Israeli schools. Afterwards, she directed a children’s therapy center in Ramot But, for the past decade, Shelley applied her many people skills, for the city of Ma’ale Adumim, providing pilot trips for potential families interested in making aliyah and helping those who did come assimilate into their new lifestyle. All of this prepared her for a regional tour business as she learned so much about the region’s sites and local treasures. “All of this so close to Jerusalem and the Dead Sea. Many people didn’t know what was going on in Ma’ale Adumim. I realized that it was time to share the secret! 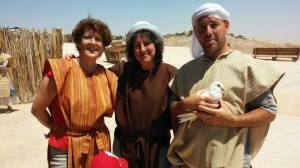 Today,Tour Adumim offers full or partial day programs of recreation, education, site-seeing, both historical and fun. It’s a re-branding of a wonderful oasis of attractions, including lookouts, museums, industries, desert sports, artists, and dining; all near Jerusalem, between the Center and the Dead Sea. Join our great family, group and custom tours!